Tempur-Pedic worked with Info Retail and BrightSign to create an engaging shopping experience that maintained maximum control of consumer/brand interaction within the retail environment. The product that resulted from this effort – the Sleep Experience Center (SEC) – has now been implemented in Tempur-Pedic’s US retail distribution showrooms. The Tempur-Pedic Sleep Experience Center is a compelling example of how digital signage can successfully integrate with rich multimedia and interactive elements to enable an entirely new way of merchandising within a competitive market. The content displayed within the SEC not only educates the customer about Tempur-Pedic products, but it entices the customer to engage with the product for a much longer period, which can increase the likelihood of a sale. "Previous iterations of the SEC were built on a PC-based solution, which presented several challenges that BrightSign helped us overcome," said Jim Stoklosa, Info Retail’s Director of Digital Signage and Development. "BrightSign gives us a stable, robust platform that saves in upfront and maintenance costs versus a similar, PC-based solution." 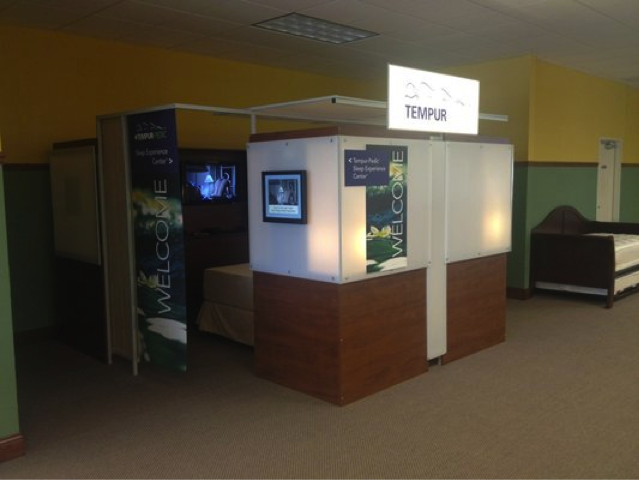 Tempur-Pedic “Sleep Experience Center” in 400+ locations nationally. Two BrightSign HD1010 models in each location for a total of 800+ units installed. Introductory messaging is delivered on an interactive 19-inch touch-screen, followed by dynamic content on a 32-inch screen that’s visible to consumers as they relax on the bed. Advanced interactivity triggers head and foot controls at specified intervals within the video presentation to enhance the customer experience. Consumers who lie on a mattress for an extended period of time are more likely to recognize the benefits of Tempur-Pedic’s unique products. Due to the lack of privacy in the retail environment, consumers are hesitant to lie, for any significant length of time, on a mattress they may be interested in purchasing. Attempts to create a sleep experience using signage powered by PC solutions were proven not to be sustainable long term. BrightSign controls the entire experience including media engagement, interactive bed functions, synchronized digital signage, and lighting. BrightSign customized the firmware, scripting and logging specifically for Info Retail and Tempur-Pedic’s needs. Screens are synchronized to control flow of information and provide customers with information that corresponds with key product benefits as they are physically demonstrated throughout the Experience. Custom scripts trigger head and foot controls, at specified intervals within the video presentation, to enhance the customer experience.